Look no further for a Langley daycare that is educational, interactive, and fun! Your child will love coming to our day care centre located on the Blacklock Fine Arts Elementary School grounds. They will participate in a dynamic educational experience! Your child will be part of fun group activities, individual work time, structured play, and even exciting excursions. Our licensed daycare centre was designed with your child’s needs in mind! Our child care facility provides daycare during school holidays and summer months! Finding quality child care in Langley may be an exhaustive process for some, and understandably so! As a parent, you want to find something safe, something your child will enjoy, and something educational to prep them for grade school. We offer a balanced curriculum, offering children a unique balance between creative free play and structured learning times. To elaborate further, we know how important the details are when it comes to looking for a daycare or preschool in the Langley area. It is about group day care being an immersive, educational experience during your child’s formative years! Therefore, our Langley daycare exists at the crossroads of education and fun. It is a preschool curriculum that is custom designed to offer things that would be of interest to a young child (phonics, music, math, outdoor time, etc), while always having a learning component at its base. Using phonics we discover language learning topics. Using math we learn counting, matching and memorizing. Using science we engage with animal species, learn about the environment, and do fun, age-appropriate science experiments. Your child will learn songs about various educational topics, practice memorizing lyrics, sing along in time and pace, and use their hand coordination to clap rhythms. We teach children basics of the French language. With paint, sprinkles, glue and tape, preschool-age kids can express themselves and their imaginations. During drama we role play and engage in active storytelling with costumes, wands, hats and more. Of course it will be great for your child to get some fresh air and discover new places! But, we make sure they are intaking experiences that teach them something about the world they may have not known. There will be pre- and post-trip activities to heighten their understanding of what they are experiencing, whether it be a movie outing, museum, or nature walk. Whether it’s practicing appropriate public behaviour at a movie theatre, learning how to swim, or releasing energy at an indoor fun zone, your child won’t be confined within four walls day in and day out! All of these things (and more!) will appear as a fun and exciting to your child, but will always be fueled by an educational purpose. Our local Langley preschool is nestled into a cute portable on the grounds of Blacklock Fine Arts Elementary School. This integration highlights just how important a preschool program is in being a stepping stone to grade school. Daily, your child will be able to get familiar with the happenings of an elementary school setting. Then, they can eventually transition without feeling intimidated, disoriented, or overwhelmed. Your child can enrol in our preschool program starting at 2 ½ years old and then simply continue on with before and after school care when they get to Elementary school! It will also be an advantage for parents with multiple children. Pick ups and drop offs will be in the same vicinity, what a time saver! Also, being next to Langley City Park, your family can take advantage of the expansive green space that’s home to Al Anderson Memorial Pool and Langley Community Music School. As a Langley child care provider, we’ve created a space where your child will be led by licensed early childhood educators. They are a team of individuals that will be making your child’s education a priority every single day by being attentive, adaptable, and fun! 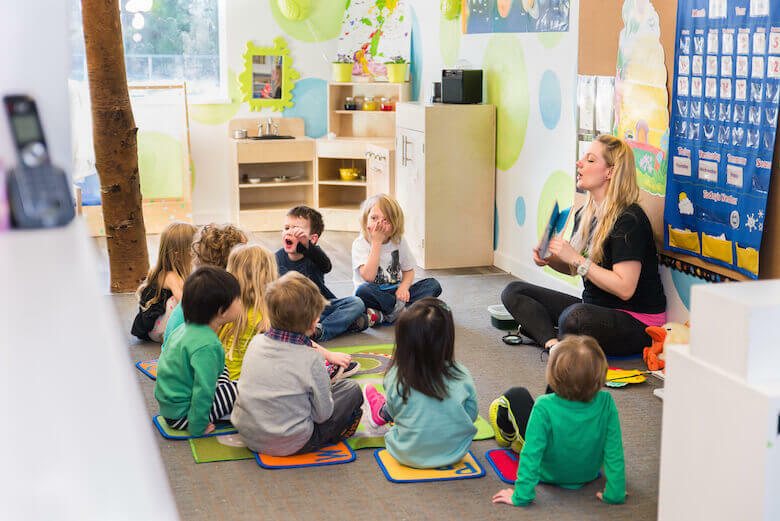 It’s a pre kindergarten program in Langley that combines long standing early-education methods with more modern ‘structured play’ approaches. Animals: Children will discover a number of different species and their behaviours. They’ll enjoy learning that butterflies emerge from cocoons, or that bees travel to pollinate. They will then mimic being curled in a cocoon or run around ‘flying’ during gross motor skills activities. Creative Activities: Singing, dancing, acting, arts and crafts that will all instil confidence and fuel positive interactions with peers. Play time: Utilizing academic-focused games that require counting, building with their hands, and cooperating with others. Also, occasionally being paired with an older child during our ‘Buddy Days’ to respect and learn from peers. Open-ended play is also encouraged. Snack time: Of course a child can’t say no to a snack! Snack time at our daycare is a conscious opportunity to make healthy choices, share with others, and learn about where food comes from. Outdoor time: Our location is also ideally situated next to a waterpark and outdoor pool (for swimming lessons). We also have a few excellent parks near by, a fantastic playground, a library, creeks and ponds and a grass field with baseball diamonds. Enrol at our child care facility in Langley today! If you would like to tour our facilities, meet our staff, or have any additional questions, please contact us to pre-book an appointment or join a group tour. Please don’t show up without an appointment or calling in advance. We would love to meet you and your child!